SYNTHA-6® ISOLATE is an ultra-premium protein powder consisting of a 50/50 blend of Whey Protein Isolate and Milk Protein Isolate. BSN®’s unique ISOLAST protein matrix combines the advantages of both fast and slow digesting protein sources that have had much of the fat, sugar and other undesirable components ‘isolated’ out, making SYNTHA-6® ISOLATE the ideal post-workout recovery shake. 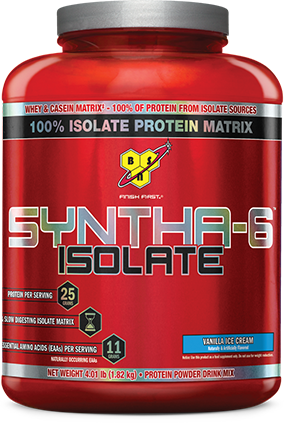 SYNTHA-6® ISOLATE provides 25 grams of high-quality protein and the same delicious taste as SYNTHA-6®, thanks to BSN®'s exclusive flavor technology. SYNTHA-6® and SYNTHA-6® ISOLATE represent two different protein formulas that can both fit comfortably in any nutritional plan. SYNTHA-6® employs a multi-functional protein formula with a well-rounded nutritional profile that makes it an excellent choice first thing in the morning, as a high-protein snack option, or an anytime-recovery shake. And while SYNTHA-6® ISOLATE is a perfectly good choice for these applications as well, its strength lies in a unique protein formula comprised entirely of isolate protein sources with less calories, fat and carbohydrates than SYNTHA-6®, making it the ultimate choice for a post workout recovery or bedtime shake.